When my cofounder Alex and I decided to take Penny from fun hackathon project to real product, we knew nothing about growth. Sure, we had done the requisite googling on the matter to find some inspiration. When you search for things like “how to get users” or “growing your startup” or “wtf am I doing please help,” you’ll find no shortage of get-rich-quick type articles, businesses hawking their services, individuals peddling their expertise, and on and on. The problem is, most of the articles we found (1) lacked actionable content, (2) were blatant advertisements, or (3) were just plain unhelpful. They talk about going to conferences to build your network, paying for services like Salesforce, or establishing a social media presence for your new company. Well, let me tell you that none of those are helpful when you’re a two person team trying to get your first handful of users. Many of those growth strategies are targeted at companies that already have a few thousand users under their belt and have money and bandwidth to spare — you know, the ones that could afford to pay for advertising or put out their own blog posts or cultivate their social media presence. 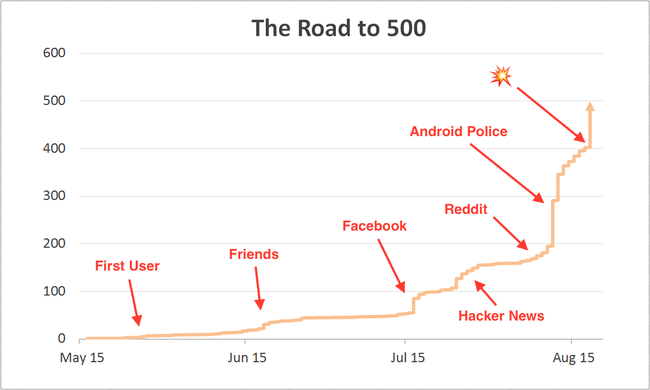 In this post, I’m going to detail exactly how Alex and I reached our first 500 users. Our strategies may not be applicable to everyone (especially not to those in the enterprise space) but at the very least it should shed some light on an oft-ignored part of a startup’s life: the beginning. But first, some caveats: Penny is pre-revenue (at the time of this writing), so strategies that required spending money were out of the question. For many reasons we also wanted to avoid the traditional tech news outlets to start, so blasting out emails to TechCrunch and The Next Web was also out of the question. Our first ten users were our easiest. Alex and I (but especially Alex) worked our butts off to get an MVP out the door as quickly as possible. We got started in earnest on a Friday and the following Friday onboarded our very first non-Mitch-or-Alex user: my girlfriend. She hit about 12 different bugs, but we sat right beside her and fixed them on the fly until she had finally linked a bank account to Penny. Luckily for me (and Alex), I have a patient girlfriend. Method 1: Significant others, best friends, roommates. From there, we took another handful of days to iron out all of the rough edges we noticed during that first onboarding. Then, we gradually added users 2 through 10, incorporating feedback and learnings as we went. Those users were sourced from the dozens of people we interviewed leading up to actually writing any code; specifically, we sought out the people who expressed the most excitement about our idea. (Side note: if you haven’t talked to potential users or they aren’t excited about your idea, you should have an uneasy feeling in your stomach right now.) The interviewees, in turn, were largely sourced from friends, family, and a hodgepodge of personal finance experts that were one degree removed. Method 2: Product research participants. And with that, our first ten users were in the bag! One thing to note: we did our best to onboard all of these users in person so we could watch their experience first hand. It slowed us down but was also invaluable. Going from 10 users to 50 was only slightly more challenging. Now is probably a good time to mention that we’re very fortunate to have a strong network of colleagues and friends. I’m always nervous about leaning on my friend group when it comes to project ideas or startup ventures — I have an unreasonable fear of becoming that guy. Luckily for me, I hardly had to breathe in the direction of that network before they embraced our project (at this point, Penny was still very much a project) with open arms. The trick is to be tasteful about it and remember that your project isn’t the most important thing in their lives. Sincerity goes a long way too. Method 3: Facebook and friends. One Facebook post about Penny and one message to an oversized group chat later, and we had our first 50 users. Long story short: don’t underestimate the value of your own network. To start, we decided to pull the trigger on a real marketing page. I was at first pretty shy about investing the effort, but Alex’s intuition turned out to be spot on: having a quality marketing page lends credibility to what you’re working on and makes your job much easier. Prerequisite: A good marketing page. Assuming the page ends up having good conversion rates (kind of hard to calculate at first), you can focus your attention on driving quality traffic to that marketing page and let the rest take care of itself. Once our marketing page was up and running, we turned our attention to actually driving traffic to it. Luckily, we had a very scientific and precise plan to do so: the shotgun approach. We brainstormed about ten ways to drive traffic to the site with a marketing friend of ours, whittled that list down based on expected traffic per unit of effort (and weighted it so that traffic now counts more than traffic later), and plowed forward with reckless abandon. Our first step was to share Penny with some early adopter communities. Method 4: Share with early adopter communities. Unfortunately, neither Alex nor I had existing influence on any of the more popular tech communities out there like Reddit or Hacker News, so we had to work around that hurdle or build influence from scratch. For starters, we decided to post to Show HN — a part of Hacker News purpose-built for sharing your project with the community — without any influence, because YOLO. On the day we shared it, we had about 700 unique people visit our website, of which about 100 clicked the download button and roughly 40 of them signed up. Given that most ‘upvoting’ sites like this have very binary results (either you get traffic or you don’t), we were happy with the outcome. While that was going on, I set about contributing to Reddit in a meaningful way (answering questions about personal finance, posting funny cat gifs, etc.) since the Reddit community doesn’t take kindly to people showing up for the first time and shouting “LOOK AT WHAT I BUILT!” I spent some time doing that over the course of a couple weeks before I was satisfied. We then started engaging with specific subreddits (for the uninitiated: a subreddit is a community with a theme, such as personal finance, entrepreneur, or corgie, and is typically preceded by /r/). For example, we posted about how we made the powerful, mobile friendly animations on our website to /r/web_design. While we didn’t ask for feedback on the product itself, people saw it and took interest. All told, we brought in roughly 30 users from Reddit. Our next step was to submit Penny to some smaller tech aggregating sites and forums such as alternativeTo, AndroidPIT, and AppShopper. If you pursue a similar strategy, you might find submit.co helpful. Method 5: Submit to tech aggregating sites. As it turns out, this approach had pretty minimal impact with one notable exception: we made it into one of Android Police’s biweekly recap articles and ended up seeing a big spike in Android sign ups. One person wrote into us from the Philippines asking why they couldn’t download the app (we’re US only right now). It wasn’t until we asked him how he found out about Penny that we discovered the article. That amounted to almost 200 new signups, which just about doubled our user count over the course of two days. Our final step on the road to 500 was to reach out to personal finance bloggers. Method 6: Reach out to experts. Given our strong focus on getting quality feedback, our outreach mostly consisted of asking the people we consider experts (in this case, personal finance bloggers) for feedback on what we had built. I’ll be the first to admit this isn’t so much a method of growth as it is a channel for feedback, but on the occasion that someone takes a particularly strong interest, growth (or at least exposure) usually ensues. These methods have and will continue to be useful well beyond the 500 user mark. However, they were critical to jump-starting our expansion beyond friends and family and are especially well-suited to early, more modest user growth. To recap, here’s an annotated graph of our signups over time (truncated at 500 users). If you were wondering, the 💥 at the end isn’t made up. Things got pretty interesting around that time — but that’s another story entirely 😉. As always, feedback is welcome: @dontmitch or mitch [at] pennyapp.io.